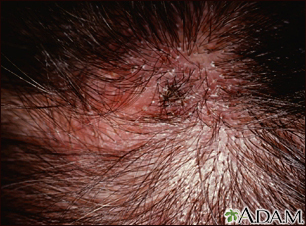 In the scalp, fungal infections often form circular, scaly, inflamed patches. Frequently, there can be temporary hair loss (hair returns when infection clears but if treatment is delayed and scarring results, permanent hair loss can be seen). This is a classical example of ringworm (tinea capitis) in a young child.